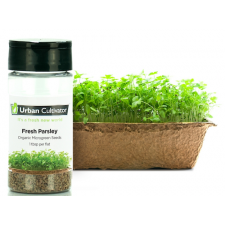 Organic Fresh Parsley seeds perfected for indoor growing. Grows four flats of Fresh Parsley microgreens. Parsley is widely used around the globe to season meats, soups, stews and potato dishes. Parsley can be used as a garnish or as a palette cleanser because of its natural fresh flavor. Parsley is rich in many vital vitamins, including Vitamin C, B 12, K and A. This means parsley keeps your immune system strong, tones your bones and heals the nervous system, too. Regular use of parsley can help control your blood pressure. The folic acid in this herb is like a tonic for your heart. It helps flush out excess fluid from the body, thus supporting kidney function.